The first time I taught a class on the book of Hebrews, I was not thoroughly acquainted with the secondary literature on the book. I was only a few feet deep in the swift stream of scholarly discussions. That semester, I was also teaching a course on the Pentateuch. This experience left a deep impression on my understanding of the writer’s argument in the letter. As we worked through the textual strategies of the Pentateuch as a book in the morning, we often came across those same texts, themes, and theological conclusions in the afternoon Hebrews course. There were a few students in both courses, and we agreed that it was sometimes difficult to remember which class we were supposed to be in! In short, the intensive reading and discussion of the Pentateuch and the letter to the Hebrews created an intertextual force field that gave me a line of sight across the terrain of the biblical canon. In the Hebrews course, we kept returning again and again to the final chapters of Deuteronomy. In particular, we kept hearing hints of the melody line from the “song of Moses” as we worked through Hebrews. Several times throughout the semester, I thought, someone needs to write a high-level monograph on the relationship between Hebrews and Deuteronomy, with at least an initial focus on the “song of Moses” in Deut 32. 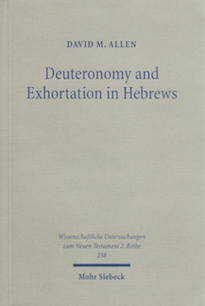 Thus and so, I was pleased to come across David M. Allen’s book, Deuteronomy and Exhortation in Hebrews: A Study in Narrative Re-presentation. In this reworking of his doctoral dissertation (at the University of Edinburgh), Allen examines the relationship between the Old Testament book of Deuteronomy and the New Testament letter to the Hebrews. Recognizing the avalanche of secondary literature on the New Testament’s use of the Old Testament, Allen pursues a specific avenue of inquiry: “the way in which an individual OT book functions corporately within the letter” (4). So, Allen examines the use of Deuteronomy in the letter, “attempting to discern how the latter’s various OT motifs might contribute to a ‘Deuteronomic’ reading of the letter” (4). Allen’s approach is “intertextual in a broad, though not unlimited sense” (15). He limits his scope to “that exchange between the textual worlds created by Deuteronomy and Hebrews” (15). In particular, Allen argues that it is “perfectly possible that the author’s choice of OT materials (quotations, allusions, echoes, characters, themes et al) are not merely an apologetic or coincidental proof texts, but rather corporately reconstruct a familiar OT narrative that serves the author’s hortatory purpose” (4). This statement indicates two areas that make Allen’s study a unique contribution. First, Allen examines the use of individual citations of Deuteronomy but also couples that with an analysis of the impact of the book as a whole on the writer’s argument. Second, Allen seeks to uncover the effect and impact of Deuteronomy on the exhortation sections of the letter. Following broadly George Guthrie’s insight that there are discernible strands of both exposition and exhortation in the letter, Allen assesses the use of the Old Testament in these particular sections (see 12-15). These exhortation sections sometimes do not receive as much intertextual analysis as the exposition sections (e.g., the Christological development of Heb 1:1-14). In his study of Deuteronomy, as well, Allen focuses on the “Deuteronomic paraenetic material” that has a “life of its own distinct from the legal corpus” (13). Allen argues in this regard that “the vast majority of connections between the two texts are found within their respective hortatory material” (13). Accordingly, one of Allen’s central contributions is to bring together a close study of the use of the Old Testament in the letter (with an emphasis on the book of Deut) with an extended analysis of the exhortation sections of both writings. Both texts appeal to past events/history as grounds for action in the present. Both invest the land motif with a soteriological character, and define apostasy in terms of the failure to enter that land. Both are sermonic or homiletic in character and appeal for attention to the spoken word. Both climax in discourse focused around two mountains, with cursing and blessing motifs prominent in each montage. Likewise, each one explicates a covenant that marks the end of the Mosaic era and a consequent change in leadership to a figure named Ἰησοῦς. "Such surface similarities," Allen insists, "are actually symptoms of, or signposts to, a Deuteronomic reading of Hebrews” (5). Allen treats Deuteronomy as a compositional whole that includes Deut 1-34, recognizing that “this was the textual form likely available to the NT writers” (9). Further, the “Deuteronomic posture” is one that accounts for “the narrative’s dominant pre-entry perspective” (10, Allen adds, “however ‘fictitious’ this might be”). The book’s final form perspective is “the Moab, pre-entry handover moment of the discourse” (10). The implied audience of Deuteronomy, then, “stand at the threshold of entry into the land and await the prophesied blessing or curse which would subsequently accompany life within it” (10). For Allen, this whole-book perspective of Deuteronomy is what should impact a reading of Hebrews. 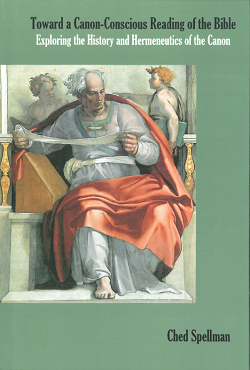 To demonstrate the reality of this inner-biblical connection, Allen examines the various ties that bind these books together. In chapter two, Allen provides a study of the text and function of the Song of Moses in Deut 32. This is a strategic text within the scope of Deuteronomy, and it also has an “independent existence” as a well-cited often “sung” text in the history of Israel/Judaism. In chapter three, Allen examines the Deteronomic quotations, strong allusions, echoes, and narrative allusions in Hebrews. He identifies 6 quotations, 6 strong allusions, 5-6 echoes, and 3 narrative allusions to the text of Deuteronomy. The song of Moses in Deut 32 is referred to at least 8 times. Moses’ song, though, also provides a particularly prominent theological and conceptual backdrop to the exhortation sections of the letter. As Allen writes, “this impressive and consistent textual use of Deuteronomy suggests that Hebrews has reflected upon its source text’s narrative situation in order both to shape its hortatory purpose and to articulate evocatively the consequences of apostasy” (109). Alongside these strong textual links, there are also a number of other features that coordinate Deuteronomy and Hebrews. In chapter four, Allen highlights three major themes that are prominent in both texts: the centrality of “covenant,” the blessing/cursing imagery, and the focus and appeal to the “land.” In chapter five, Allen uncovers the “homiletical affinities” between Hebrews and Deuteronomy (156ff). The homiletic shaping of Hebrews indicates that “its argument mirrors that of its Deuteronomic source” (198). The story of Deuteronomy, then, is “replayed within the [New Covenant] context of Hebrews” (198). In chapter six, Allen brings his argument to a climax by examining “re-presentation” in both Deuteronomy and Hebrews. After laying the exegetical (chap 3), thematic (chap 4), and rhetorical (chap 5) groundwork, Allen here constructs his climactic intertextual insight. The book of Deuteronomy, and in particular Deut 28-34, is designed to interpret and “re-present” Israel’s history. This re-presentation is for the purpose of persuading contemporary readers that the Mosaic covenant is obsolete and a new covenant is needed. The audience, then, is poised on the threshold of an entirely new way of relating to God as his covenant people. The “situational relationship” between the respective audiences is “the common Deuteronomy-Hebrews thread, with both audiences positioned at the critical moment of decision at the threshold of their inheritance” (203). Accordingly, Hebrews not only cites and draws themes from Deuteronomy. Rather, Hebrews appropriates an entire complex of features (audience, purpose, literary type, and method) from Deuteronomy. The frequent engagement with the final chapters of Deut is not an accident; rather, “it happens consistently through the letter’s hortatory material, gives collective explanatory power to the epistle's admonitions, and in toto composes a perspective of new covenant handover at the threshold of the land” (225). In other words, these two books share a wide interpretive horizon, and they invite their readers to join them there. The frequent textual citation of Deuteronomy, the replication of key themes such as covenant and land, the adoption of the Song and its association with the end of the Mosaic era all point to an overarching re-presentation of the Deuteronomic choice between life and death, apostasy and faithfulness, blessing and curse. Deuteronomy’s paraenesis becomes Hebrews’ paraenesis. Hebrews, therefore, does not just use Deuteronomy; it becomes a new Deuteronomy and challenges its predecessor’s contemporary hegemony. By undertaking this intertextual engagement with Deuteronomy, the epistle’s writer transfers his audience away from their allegiance to an outdated, redundant Sinai existence, dons Mosaic garments and addresses them afresh on the plains of Moab. Within Hebrews’ new covenant situation, the exhortation to “Choose Life” remains as pressing as ever. For good reason, Allen’s volume has impacted the discussion of Hebrews’ use of the Old Testament. As noted above, Allen’s work provides a fresh impetus for interpreters to consider the role of the Pentateuch’s narratives in the coherence and artistry of the exhortation sections of the letter. Further, in addition to the helpful exegesis of intertextual links, the most important contribution of this work is the way it is able to account for the non-citational uses of Deuteronomy within the letter. Allen’s overarching thesis and many of his textual connections still need to be examined, re-evaluated, and further developed; however, he has skillfully set these two biblical books in relation to one another and has compellingly demonstrated that this particular construal is not arbitrary but rather a profoundly text-immanent feature. Also in Midwestern Journal of Theology 14.2 (Fall 2015): 108-13.